a. A filthy or soiling substance, such as mud or dust. 3. 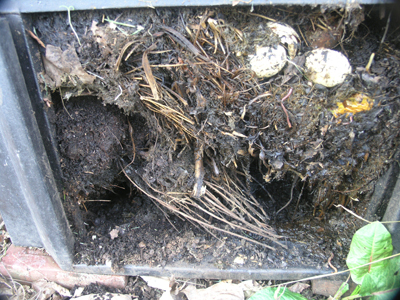 A squalid or filthy condition. 4. One that is mean, contemptible, or vile. a. Obscene language or subject matter. b. Malicious or scandalous gossip. c. Information that embarrasses or accuses. 6. Unethical behavior or practice; corruption. 7. Material, such as gravel or slag, from which metal is extracted in mining. 1. The top layer of the earth’s surface, consisting of rock and mineral particles mixed with organic matter. 2. 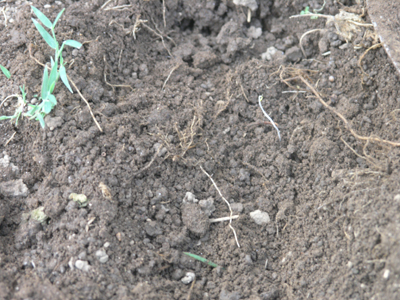 A particular kind of earth or ground: sandy soil. 3. Country; land: native soil. 4. The agricultural life: a man of the soil. 5. A place or condition favorable to growth; a breeding ground. It started with my compost bin. I grace it with kitchen scraps several times a week, and grass clippings as often as my husband fulfills his footnote in the marriage vows. Note the cavity below. That's because I recently removed several shovelfuls of beautiful compost and spread it on the bed formerly known as Zephyr Squash. All of these ingredients cook away, and are aided by red wiggler worms. 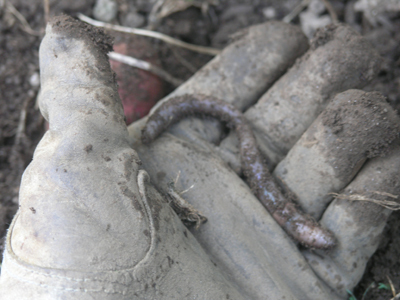 I have only seen these worms in my compost bin, never in the wilds of my garden. It is as if they spontaneously generate from coffee grounds and egg shells. They are slim, red, and they do wiggle. Two, wiggling on my trowel. I'm certain they wiggle because they are proud of their fine work. If a Red Wiggler is a Lamborghini, then this guy is a Yukon Denali. Dark, crumbly, as pretty as soil gets! When the soil is this loose and fluffy, you can harvest potatoes by hand. In fact, it is easier to do so, because your hands can feel the potatoes, whereas a trowel cannot. 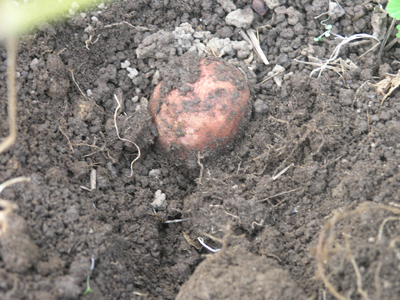 Like all births, this red potato has a messy entrance into the world. In closing, I want to share a quote from Thomas Jefferson that begins one of my favorite books, “Small-Scale Livestock Farming: A Grass-Based Approach for Health, Sustainability, and Profit,” by Carol Ekarius. Published by Storey Books in 1999, it describes and instructs the art of raising animals on grass. It reads like Truth. And Jefferson could have been speaking of our times today. Listen to his thoughts on what work should be done by Americans, and what might be best left for others, and his thoughts on the value of citizens that love the earth…and I’m certain he was thinking soil, and not dirt. “While we have land to labor, then, let us never wish to see our citizens occupied at a work-bench, or twirling a distaff. Carpenters, masons, smiths are wanting in husbandry: but, for the general operations of manufacture, let our workshops remain in Europe…. The loss by the transportation of commodities across the Atlantic will be made up in happiness and permanence of government. The mobs of great cities add just so much to the support of pure government, as sores do the strength of the human body. It seems to take a very long time. I’m certain it’s because I haven’t done what’s necessary to have the pile cook hot enough or long enough. 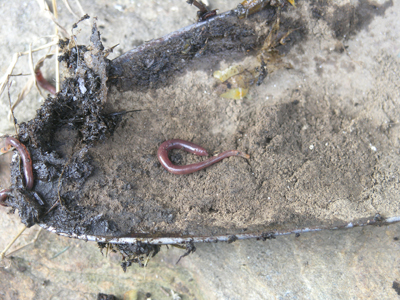 If I have worms in the compost, it is clearly not hot enough. Husband bought me a fabulous tool for turning compost that I blogged about a while ago — I’ll have to search for that post, to share the info with you, that does work and I should use it more. It is SO satisfying to spread black compost on your garden, even if the offering is small. Who knew dirt could be a present?! Merry Christmas, worms! I am just elated after reading your kind words. I hardly expected such a warm reply after writing about soil and worms! And I was very touched to think that you would have shared this with your grandmother. I appreciate that. Thank you so much! What an amusing, intelligent, tender, and informing post. I love reading Amy in the Garden! Valerie, thank you so much. I was thinking about how I am so lucky to have such interesting friends — I would never have guessed that a post about soil and worms would elicit favorable comments!! You are too cool!! !